Marcus Junius Brutus (85 – 42 BC) was the son of Brutus the Elder and Servilia Caepionis. Servilia was also mistress to Julius Caesar, prompting uncertainty regarding Brutus’ true biological father. The young Brutus started his career working for his uncle, Cato the Younger. He later held important political posts and made a fortune moneylending in the provinces, subsequently becoming one of Rome’s most influential Senators. In 49 BC when Caesar started a Roman civil war, Brutus initially aligned with Pompey (even though the pair were former enemies). After Pompey’s defeat, Brutus switched sides, and Caesar accepted him into his inner circle, even making him governor of Gaul. While Brutus appreciated Caesar’s confidence, he was troubled by colleague’s obsession with controlling Rome. He became even more disturbed as Caesar made himself non-impeachable, and gained censorial control and veto power over the Senate. By 44 BC when Caesar earned the title of Dictator for life, Brutus was alarmed to the point he took drastic action. Brutus was not alone. Many of Rome’s elite opined it was in Rome’s best interests - if not their own - to murder their dictator. On the Ides of March 44 AD, Caesar was stabbed to death by Brutus, along with dozens of other aristocrats led by Gaius Cassius Longinus. After the assassination, Brutus fled Rome, and soon became embroiled in civil war against Caesar’s co-consul, Marc Anthony, and heir, Octavian, later known as Augustus. In October 42 BC at Philippi, Rome’s latest civil war reached its climax. Brutus and his ally Cassius agreed beforehand that if victory escaped them, the best course of action would be to take their own lives. As it turned out, that suicide pact sealed their fate. As the epic Battle of Philippi unfolded, Brutus managed the upper hand against Octavian, at least to the extent he took the latter’s camp; Octavian managed to escape, according to one account by hiding himself in a marsh. Unfortunately for Cassius, he was unaware of Brutus’ achievement, and, even worse, he mistakenly thought that Brutus’ camp had fallen. Consequently, Cassius, fearing the worst, responded by dutifully committing suicide. Brutus managed to rally Cassius’ remaining forces, and fought a second battle weeks later. As it turned out, Brutus’ men were defeated, and he fled the battlefield. Realizing he would soon be captured, Brutus committed suicide. 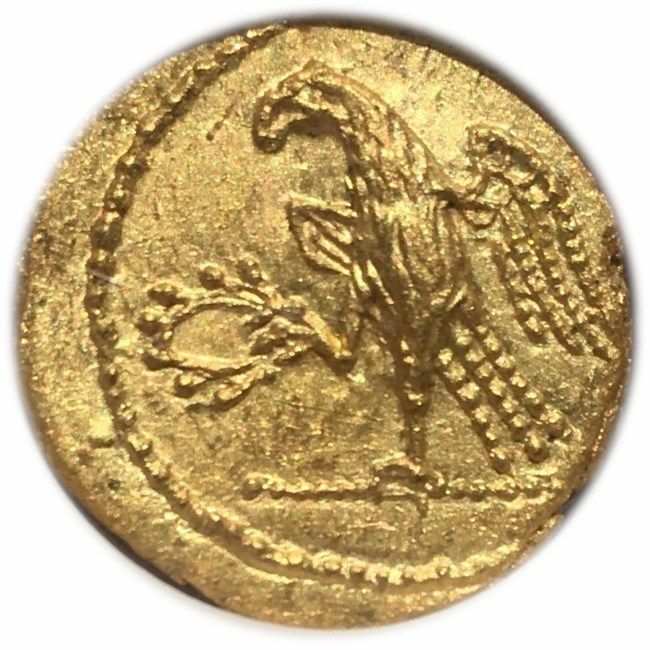 This gold stater was struck in Thrace or Dacia concurrent with these historic events. 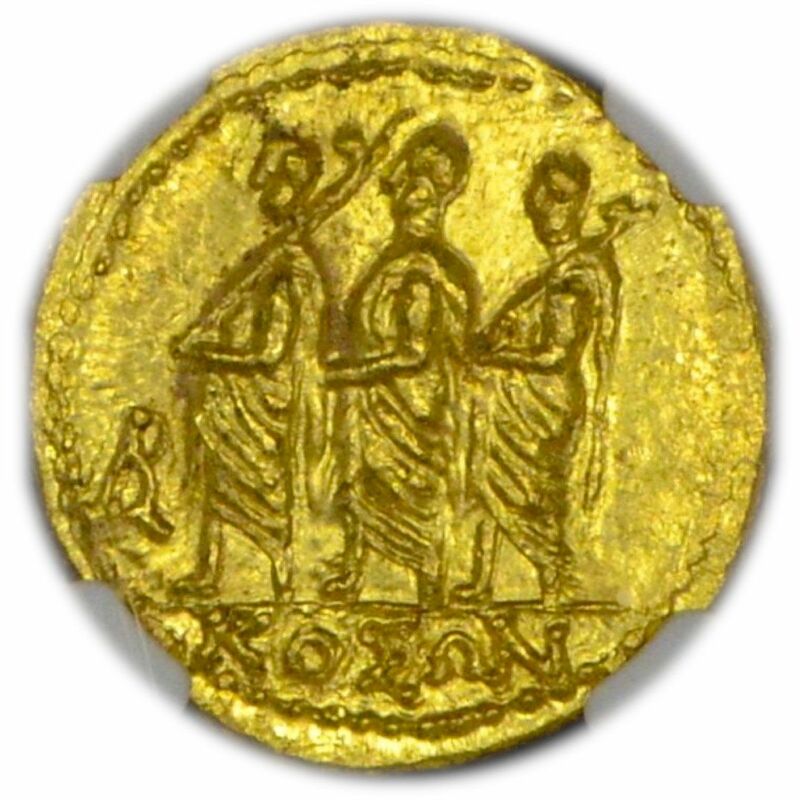 The obverse depicts three men wearing togas, walking to the left, two of them carrying objects over their shoulders. 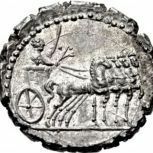 The figures are Roman lictors (bodyguards) carrying fasces (axe-like weapons), and the motif bears striking resemblance to coins issued by Brutus a decade earlier. In exergue is the enigmatic epithet KOSON. On the verso, an eagle stands on a scepter, facing to the left, its right claw raised, holding a wreath. This design also resembles earlier Roman coins. Attribution of this issue has been the subject of lively numismatic debate. According to one hypothesis (which has fallen out of favor over time) Brutus struck coins like this one after he fled from Rome to Greece, tapping into his enormous personal wealth combined with funds from sympathetic Senators. An alternate theory (which has gained favor over time) attributes a Thracian or Dacian King named Koson, who imitated Roman designs. According to this scenario, Brutus was not involved in the coins’ production besides providing numismatic inspiration. Adding to the perplexity, two versions of the coin exist, those with a mysterious BR monogram on the obverse, and those without. It has been postulated that the BR refers to Brutus. An alternate view is that the letters relates to BA(sileus), i.e, king, as in King Koson. Curiously, no other records mention a monarch by that name (although there was a King Kotison). Many modern scholars espouse the view that there was a local King Koson; perhaps he was Brutus’ ally. It is interesting to note that since ancient times, several large hoards of coins inscribed KOSON have been discovered in the land formerly known as Dacia. The largest group, comprising thousands of gold coins and other gold objects, was discovered in 1543. If there was indeed a Dacian King Koson, he apparently had access to vast wealth (adding to the mystery of his historical anonymity). Recently, both monogrammed and non-monogrammed versions of so-called Koson staters were examined for their composition. These studies provided a highly sensitive elemental fingerprint for each coin. 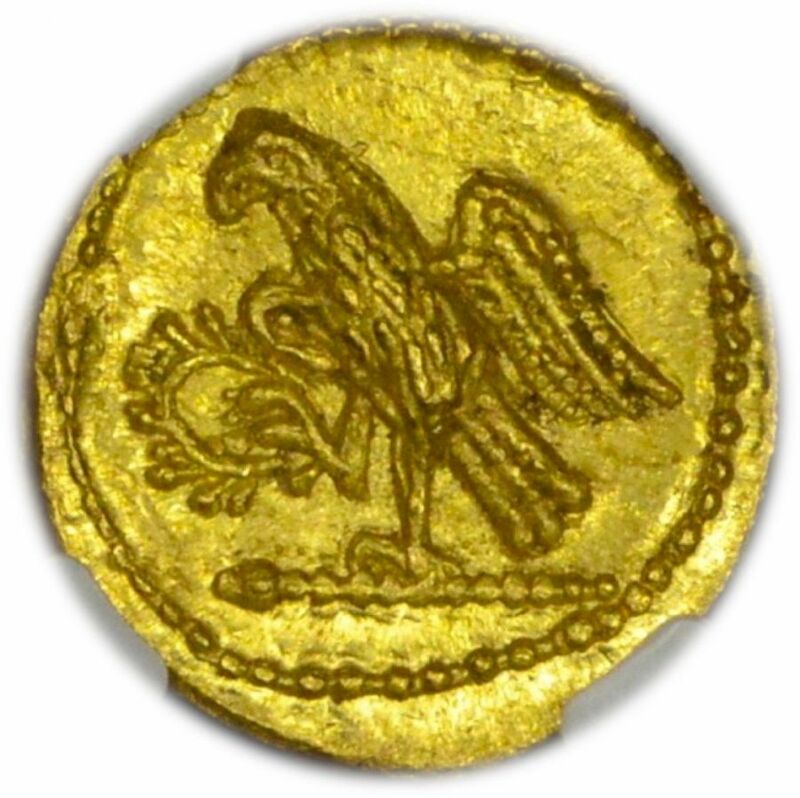 It was found that all coins without the monogram were made from native alluvial gold, (i.e., had trace amounts of tin) the same composition found for other Dacian gold artifacts (i.e., bracelets) that were made at the time. In contrast, all the coins with the BR monogram lacked tin, and were of highly purified gold. 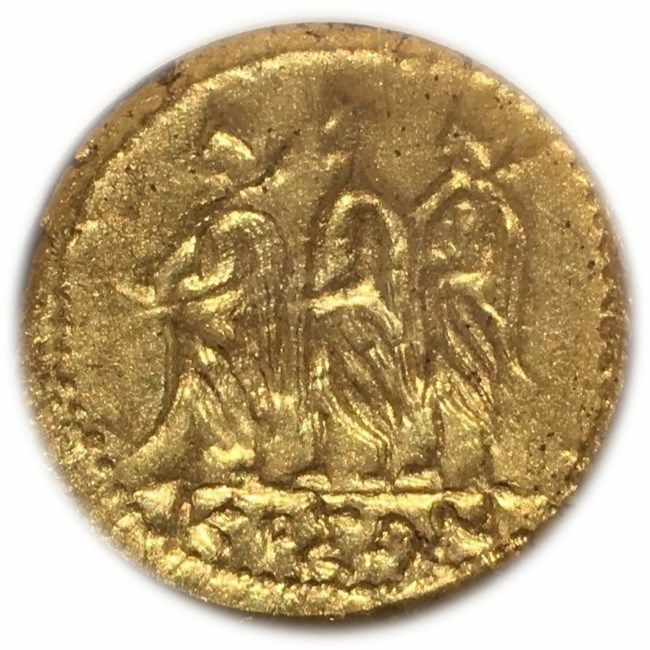 This finding leads to an intriguing possibility – BR-monogrammed coins were produced by Brutus using highly refined gold, and non-monogrammed coins were imitations by Thracians or Dacians using their own methods and local alluvial gold. This particular coin is the non-monogrammed type. At the time it was graded by NGC Ancients, its was attributed according to the Brutus origin theory. An example of the monogrammed counterpart – which, perhaps ironically, was attributed to Thrace or Dacia – is present in another NGC Custom Set, The Ancient World Collection. Whether Brutus took part of the production of either, or neither, coin remains uncertain, illustrating the fascination and intrigue of ancient coin collecting. Additional Reading: B Constantinescu, D Cristea-Stan, A Vasilescu, R Simon, D Ceccato, “Archaeometallurgical Characterization of Ancient Gold Artifacts from Romanian Museums using XRF, Micro-PIXE and Micro-SR-XRF Methods,” Proc Romanian Acad 13:19-26, 2012. Coin Details: ROMAN – BRUTUS, 44-42 BC, AV Stater (8.52 g), NGC Grade: Choice Uncirculated, Obverse: Roman Consul with two Lictors, KOSON in exergue, Reverse: Eagle on scepter, holding wreath, References: RPC 1701B; BMC Thrace pg. 208, 2; BMCRR II pg. 475, 50.
thanks for this, I was researching these myself a couple months ago and did not find a lot of this. The XRF testing of metal composition is the next frontier. 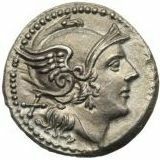 One passage I found in my own research about Thrace and Brutus and Gold is from Appian, where there is a reference to gold and silver coins bearing the face of Brutus himself struck from the treasure entrusted to Brutus by Polemocratia, the widow of a Thracian king Sadalas. King Sadalas had been murdered by his enemies. Those coins bearing the portrait of Brutus and the words "eid mar" are super expensive, in silver or gold. But this is a semi-contemporary reference to a Thracian source of gold and silver for Brutus n friends at about the same time these "KOSON" staters are thought to come from. Indeed XRF is the next frontier for studying ancient coinage. Since I am a scientist, and actually employ XRF (not for examining purity of metals, but rather carbon and silicon materials) I found that paper particularly fascinating. I am also intrigued about the sources that describe the link between Brutus and Polemocratia. I am not sure any definitive conclusions can be made from that, but is at least suggestive of a link between Brutus and those staters. If you are interested, here are some pics of my other KOSON/Brutus stater posted below. It is hard to tell from the pics (I always have trouble taking photos of coins), but in hand I get the distinct impression that my monogram coin is comprised of higher quality gold than my non-monogram coin, consistent with Constantinescu et al.